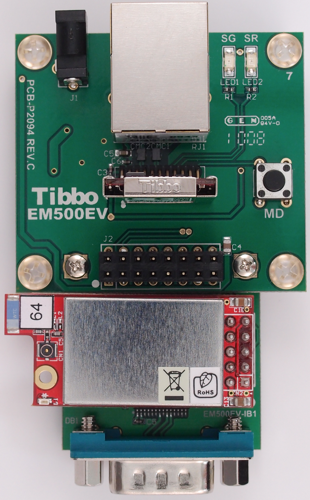 The EM500EV development system with the IB1 interface board. Notice the orientation of the GA1000 module. The EM500EV-IB1 features a connector for the GA1000 Wi-Fi add-on module, 1024KBytes of flash memory, and a serial port with limited functionality (RX, TX, CTS, and RTS lines only). Connection to the GA1000 is implemented according to the schematic diagram C presented in the Connecting GA1000 to Tibbo Devices topic. Connection to the flash memory is implemented according to the schematic diagram presented in the Flash and EEPROM Memory topic (of the EM500 documentation).